For up-to-date ATV trail maps and information, visit Maine ATV Trails and ATV Maine. 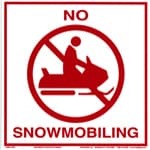 For up-to-date Snowmobile trail maps and information, visit Maine Snowmobile Trails and Snowmobile Maine. Maine has an amazing network of trails making it possible for ATV and snowmobile riders to explore thousands of miles across the state. Access to these trails is made possible thanks in part to many generous private landowners. 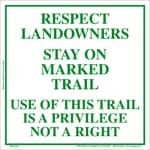 To ensure access to these trails remains open for recreational use, please respect landowners and stay on the marked trails! 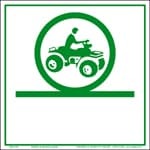 Indicates trail is open to ATV use. These markers may also include additional information about the trail. 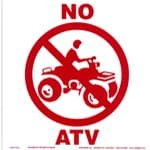 Indicates trail is closed to ATV use. Indicates trail is open to snowmobile use. These markers may also include additional information about the trail. 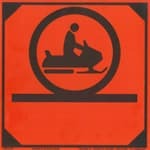 Indicates that trail is closed to snowmobile use. 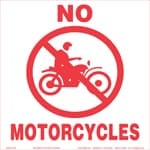 Indicates trail is closed to motorcycles. Note: Interconnected Trail System (ITS) trails are not always open to ATV use. ITS trails that are open to ATV use will be posted with ATV trail markers.